Hsieh Hsu Machinery Co., Ltd.
2. 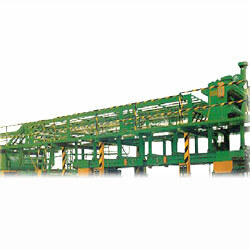 Stacking stage can be lifted and lowered by roll chain. 1. 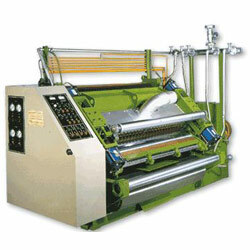 Cutting machine: 1 set. 2. 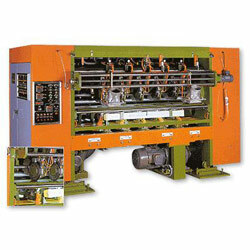 N.C. control panel with control system: 1 set. 3. D.C. servo motor 37KW (55KW): 1 piece. 4. D.C. servo motor driver: 1 piece. 1. One station scoring and slitting tool. 2. Slitting capacity: 4 out (slitting tool: 5 sets and scoring tool: 8 sets). 3. Slitting and scoring bracket's shaft: with 120 mm in diameter and the surface is well treated by grind and plated-chrome. 1. Using when making an order change or to remove poor quality sheet. 2. When the "cut" button is pushed, the clutch is engaged and the sheet is cut. 1. With one unit of transmission gear box. 2. 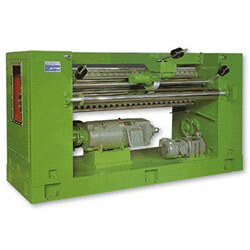 The surface of the drive roll is wrapped with non-slip belt to extend cotton belt and its service life. 3. 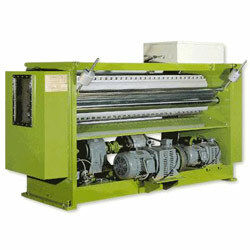 The power source of double-facer's cotton belt comes from this machine. 1. 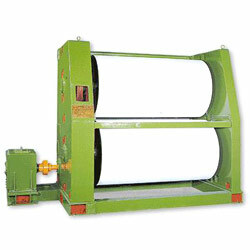 3-stage adjustable pressure for weight roller is controlled by pneumatic system. 2. 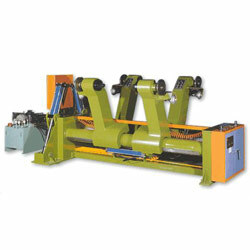 Tension control and right/left adjustments of upper cotten belt are controlled by pneumatic system. 1. 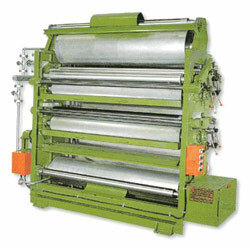 The surface of glue roller is embossed by netting design and plated by chrome treatment. 2. The surface of ductor roller is grinded and plated by chrome treatment. 3. The surface of pressure roller is plated by chrome treatment. 1. Type: fingless single facer. 2. 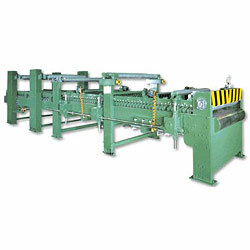 Upper and lower corrugating rolls are made of Ni-Cr-Mo alloy steel, with heated-treatment for hardness shore 700 or more, and the surface is well treated by grind and plated-chrome. 2. Max. paper diameter: 1500 mm. 3. Clamping of open-close, right-left, and lifted-lower adjustment are operated by hydraulic system. 4. Tension control by electric air brake. 1. 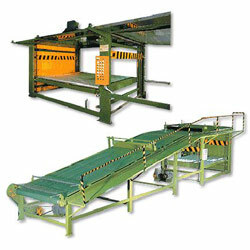 According to cardboard types, they have single, double, triplex bridge conveyor. 2. With up-guide conveyor installed upon each single facer.